This is a photo of my friend, Michael McCormick and I. We go on the motorbikes together. We do lots of charity runs, like, at Christmas we pulled a sleigh with the bikes and delivered toys and presents to local schools. I love spinning around on the motorbike! David on Michael: Michael is a funny and happy guy. He invites me to the bikers club and we have great craic. I’m one of the lads when I am with him – part of the gang. He makes me laugh. Michael on David: David loves the motorbikes and is always up for heading out, rain, hail or shine! 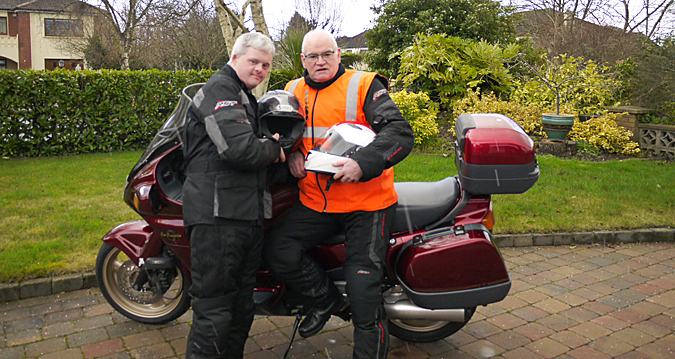 He just loves it and is a great pillion passenger, great company and always good for a laugh.